Brenden Archer, Shadle Park HS: "Bringing About a Renaissance"
On January 15th, 2019, the Shadle Park class of 2019 became the only class in school history that has been able to say they never won Groovy Shoes. 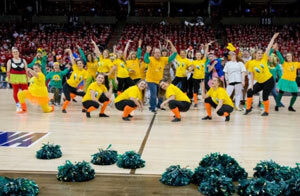 For many Highlanders, Groovy Shoes, the annual spirit competition between Shadle Park and its rival school, is the bar that is set again and again each year to determine the adequacy of our spirit. Win, and our egos are satisfied for another year, until we must offer up the Groovy Shoes once again on the sacrificial altar dedicated to the spirit gods. We do this every January. But although no tale could tell how crushing each defeat has been (amplified by a mixture of sheer dedication and unjust judging), it reasonably could be argued that no other Groovy Shoes outcome could have served the school better, because it exposed the very disease that many Highlanders have coped with over the past four years: the slow and gradual forgetfulness of green-and-gold Highlander pride. 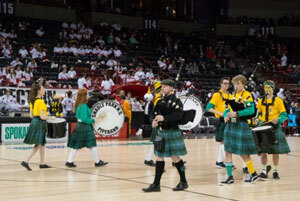 Despite the 4-year losing streak in a singular spirit competition, however, there are several within the school who are actively pursuing a better Shadle Park and are turning the culture around, perhaps as a response either toward our four-year losing streak or toward the underwhelming 700 students who came to cheer in our most recent defeat. I have had the privilege to see and be a part of a lot of this culture change that is being engineered because I have been involved in leadership, and that opportunity is a big part of why I’m thankful for the program. Because of our Groovy Shoes losses, the class has been able to dig deep into why our school keeps losing, and how we can change those Ls to Ws. Jordan Frost, our student teacher, has done an exceptional job with guiding us through these topics, showing us how to market ourselves, build a brand, and sell a message in order to flip the mindsets within the student body. Frost has given us case studies of other schools within Washington so we can pull from what they do in order to create a culture, which of course to me, as a LEAP member, brought the whole purpose of LEAP full circle. We’ve welcomed students at our doors, put on food drives, and facilitated spirit weeks in order to remind students what it’s like to be a Highlander. And ever so slowly, we have seen some of our efforts pay off. The culture is changing not only through the leadership program, but also through the fine arts department as well. In particular, Matt Wenman, our first year instrumental music director, has totally flipped the culture and goals of the music program, which has not only produced better music and musicians, but has also encouraged a culture of hard work. His enthusiasm and passion for music performance has inspired many of us to work harder, and it has been great to see the music we have produced as jazz bands, symphonic bands, and orchestras because of his commitment to a larger cause. But all that doesn’t even halfway describe what people at Shadle Park are doing. Teachers are meeting in order to establish a better purpose for our Advisory period and a more effective schedule to a typical school week. National Honor Society is gaining a bigger presence within the school, running food drives that were proposed by students. Administrators are branding and advertising the school and pioneering a program called “Highlander for a Day” that brings eighth graders to the school (for a day) to shadow a veteran and proud Highlander, all to give the upcoming freshmen a smoother transition into high school; and leadership is establishing a bigger and more positive social media presence to keep every Highlander in the know. It’s almost as if the Highlander community is having its own Enlightenment. It’s contagious, and this disease is spreading. So while the class of 2019 has certainly borne the brunt of an epitomized apathetic culture, it is a sacrifice that many members of the class have graciously accepted. Even though the 2019 class might not be around to see this movement come to fruition, it is certainly something that many of us have had the pleasure in starting. 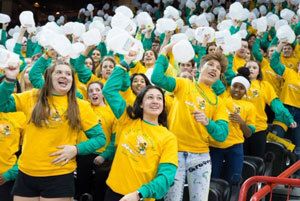 Many leadership students have affectionately dubbed their actions as the emergence of the “Shadle Renaissance,” due to its inescapable aura, and whether consciously or not, many students and staff alike are finally coming together to achieve a similar goal. The unity that is starting to materialize within our hallowed brick walls is both enlightening and encouraging, and the very notion of its existence invigorates many leadership students into action—toward the hope and vision of a renewed and rejuvenated Shadle Park Highlander culture. Many of those students are seniors, fueled only by their love of Shadle Park, as they are selflessly giving to a cause that can only give back to them by being successful, beginning June 8th, 2019. While the class of 2019 might be the only class in Shadle history to lose Groovy Shoes for all four years, ultimately it is not that failure that will be our legacy, but the successes of future Shadle Park classes to come.